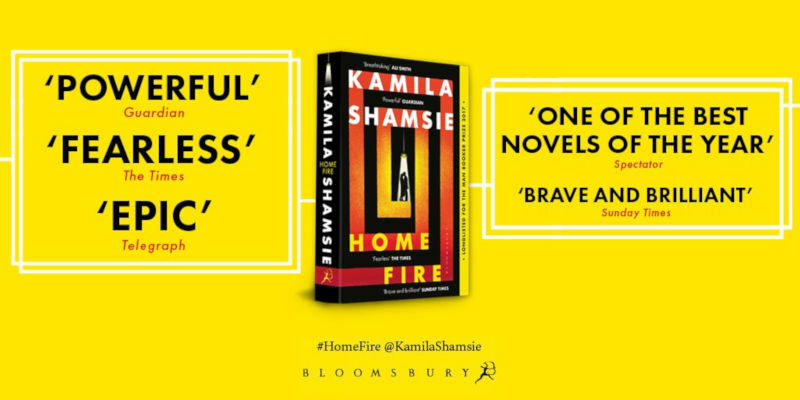 Kamila Shamsie’s brilliant novel Home Fire has won the 2018 Women’s Prize for Fiction. Read an extract from this fantastic novel. Then Eamonn enters the sisters’ lives. Handsome and privileged, he inhabits a London worlds away from theirs. As the son of a powerful British Muslim politician, Eamonn has his own birthright to live up to – or defy. Is he to be a chance at love? The means of Parvaiz’s salvation? Two families’ fates are inextricably, devastatingly entwined in this searing novel that asks: what sacrifices will we make in the name of love? Isma was going to miss her flight. The ticket wouldn’t be refunded because the airline took no responsibility for passengers who arrived at the airport three hours ahead of the departure time and were escorted to an interrogation room. She had expected the interrogation, but not the hours of waiting that would precede it, nor that it would feel so humiliating to have the contents of her suitcase inspected. She’d made sure not to pack anything that would invite comment or questions—no Quran, no family pictures, no books on her area of academic interest—but, even so, the officer took hold of every item of Isma’s clothing and ran it between her thumb and fingers, not so much searching for hidden pockets as judging the quality of the material. Finally she reached for the designer-label down jacket Isma had folded over a chair back when she entered, and held it up, one hand pinching each shoulder. “No. I don’t know. Sorry, do you mean her place or the place of my own? She lives in Northampton—that’s close to Amherst. I’ll look all around the area for whatever suits me best. So it might be Amherst, but it might not. There are some real estate listings on my phone. Which you have.” She stopped herself. The official was doing that thing that she’d encountered before in security personnel—staying quiet when you answered their question in a straightforward manner, which made you think you had to say more. And the more you said, the more guilty you sounded. The interrogation continued for nearly two hours. He wanted to know her thoughts on Shias, homosexuals, the Queen, democracy, The Great British Bake Off, the invasion of Iraq, Israel, suicide bombers, dating websites. After that early slip regarding her Britishness, she settled into the manner that she’d practiced with Aneeka playing the role of the interrogating officer, Isma responding to her sister as though she were a customer of dubious political opinions whose business Isma didn’t want to lose by voicing strenuously opposing views, but to whom she didn’t see the need to lie either. (“When people talk about the enmity between Shias and Sunni, it usually centers around some political imbalance of power, such as in Iraq or Syria—as a Brit, I don’t distinguish between one Muslim and another.” “Occupying other people’s territory generally causes more problems than it solves”—this served for both Iraq and Israel. “Killing civilians is sinful—­that’s equally true if the manner of killing is a suicide bombing or aerial bombardments or drone strikes.”) There were long intervals of silence between each answer and the next question as the man clicked keys on her laptop, examining her browser history. He knew that she was interested in the marital status of an actor from a popular TV series; that wearing a hijab didn’t stop her from buying expensive products to tame her frizzy hair; that she had searched for “how to make small talk with Americans”. You know, you don’t have to be so compliant about everything, Aneeka had said during the role-playing. Isma’s sister, not quite nineteen, with her law student brain, who knew everything about her rights and nothing about the fragility of her place in the world. For instance, if they ask you about the Queen, just say, “As an Asian I have to admire her color palette.” It’s important to show at least a tiny bit of contempt for the whole ­process. Instead, Isma had responded, I greatly admire Her Majesty’s commitment to her role. But there had been comfort in hearing her sister’s alternative answers in her head, her Ha! of triumph when the official asked a question that she’d anticipated and Isma had dismissed, such as the Great British Bake Off one. Well, if they didn’t let her board this plane—or any one after this—she would go home to Aneeka, which is what half Isma’s heart knew it should do in any case. How much of Aneeka’s heart wanted that was a hard question to answer—she’d been so adamant that Isma not change her plans for America, and whether this was selflessness or a wish to be left alone was something even Aneeka herself didn’t seem to know. A tiny flicker in Isma’s brain signaled a thought about Parvaiz that was trying to surface, before it was submerged by the strength of her refusal ever to think about him again. Eventually, the door opened and the woman official walked in. Perhaps she would be the one to ask the family questions—the ones most difficult to answer, the most fraught when she’d prepared with her sister. Isma stood up, unsteady because of the pins and needles in her feet, which she’d been afraid to shake off in case she accidentally kicked the man across the desk from her. As she wheeled out her luggage she thanked the woman whose thumbprints were on her underwear, not allowing even a shade of sarcasm to enter her voice. The cold bit down on every exposed piece of skin before cutting through the layers of clothing. Isma opened her mouth and tilted her head back, breathing in the lip-numbing, teeth-aching air. Crusted snow lay all about, glinting in the lights of the terminal. Leaving her suitcase with Dr Hira Shah, who had driven two hours across Massachusetts to meet her at Logan Airport, she walked over to a mound of snow at the edge of the parking lot, took off her gloves, and pressed her fingertips down on it. At first it resisted, but then it gave way, and her fingers burrowed into the softer layers beneath. She licked snow out of her palm, relieving the dryness of her mouth. The woman in customer services at Heathrow—a Muslim—had found her a place on the next flight out, without charge; she had spent the whole journey worrying about the interrogation awaiting her in Boston, certain they would detain her or put her on a plane back to London. But the immigration official had asked only where she was going to study, said something she didn’t follow but tried to look interested in regarding the university basketball team, and waved her through. And then, as she walked out of the arrivals area, there was Dr Shah, mentor and savior, unchanged since Isma’s undergraduate days except for a few silver strands threaded through her cropped dark hair. Seeing her raise a hand in welcome, Isma understood how it might have felt, in another age, to step out on deck and see the upstretched arm of the Statue of Liberty and know you had made it, you were going to be all right. While there was still some feeling in her gloveless hands she typed a message into her phone: Arrived safely. Through security—no problems. Dr Shah here. How things with you? Stop worrying about me. Go live your life—I really want you to. The parking lot with large, confident vehicles; the broad avenues beyond; the lights gleaming everywhere, their brightness multiplied by reflecting surfaces of glass and snow. Here, there was swagger and certainty and—on this New Year’s Day of 2015—a promise of new beginnings.